This is the spot for all discussions and info about this resort. My goal is to have a page like this for each resort where we can share our experiences and ask questions of others. This looks like a neat resort! I will write a full review when I have time but we love this resort and have stayed twice. Once in 2007 and once in 2014 after the rooms and Pirate pool were renovated. We have not stayed in a Pirate Room. In 2014 it was November during free meal plan times and it was at 100% capacity the entire time and we never felt like it was a full resort and there were always busses ready to get us anytime we needed one. All of these photos show the resort at 100% . They are taken early morning or mid day, none are like 9am which I would guess would be busy because we are already in the parks. When Magical Express drops you off at the Customs House (look at the map), you check in and then you can walk out to the closest bus stop and go straight to the parks or to your room. We always go straight to the parks. At Check in last time they were not what I would call typical cast members, not nearly as happy and wonderful as usual. Just dry and like any other hotel you would go to, so I was pretty ticked off. I expect magic from all cast members at WDW all the time. LOL! but every other encounter with CMs in the resort was perfect. They have gone out of their way for us over and over. Its just at check in and out when its been dry at CBR. That is my only complaint about this resort and that was only on our most recent trip and could be due to occupancy. In 2014 we stayed in Jamaica and we were in building 46 which, if you look on the map, is directly across the island bridge from Port Royal and there is a super close bus stop. You want to be as close as possible to a bus stop so since this is a normal room with no upgrade charge. I would say this is the ideal spot in the resort. The walk to breakfast or anything you need in Port Royal like the food court and package pick up in the disney store is not long and its really really pretty. I would pick this exact spot again for sure. I requested it by calling less than a week before we arrived and then again when we arrived. We actually got room 4646 in building 46! That is so easy to remember that I even remembered it. Also Jamaica is located where you leave the resort so it is always either the first or last stop. Usually we would get on the bus to go to the parks and it would have to stop at the other sections, but we were first off when we got home. The thing about this huge resort is that you can go to your closest bus stop and wait or the bus that is the resort bus and it just loops around the resort so you can use it to get to any other section , to port royal, or to the customs house where you check in and out. But this bus is one you have to wait for and that is no fun. You want to be walking distance to Port Royal if at all possible. The entire time we were there, every time we walked down to the bus stop, it seemed like the bus we wanted was the first one to arrive except once. With a full resort they had lots of busses running. And after Epcot closed one night we walked out to the buses and we were slow because of photos and there were rows and rows of people in the queue for the bus. But it moved super fast because right after one bus left, another arrived and another. We literally were the 4th bus once we got to the waiting area and maybe waited a total of like 10 min. I was very impressed. We have not eaten at Shutters so someone else will have to tell you about that. We did eat breakfast about 3 mornings and there is a spinach omelette that is to die for. Perry liked his omelette too and it was made to order because he is picky. We love the pool bar and in the evenings they set up a big blow up screen to show disney movies out in front of the water right there next to the pool, pool bar and food court. Perry ordered pizza to have it delivered to him there so he could watch Finding Nemo and some of Lion King while I went to Disney Springs one night. About the new refurbished rooms. To me they are more current but are more understated than before. The tv is smaller but who cares, you only watch it to see weather and the channel that loops that video about the parks and current events at WDW. There is a fridge, tiny safe, and the blow dryers are good. This is a moderate resort so the toilet paper is better than the value resorts but if you love the big thick stuff you have at home, take it with you. You are only getting the charmin in the deluxe resorts. LOL! My sister had a surprise waiting for us in the room and the WDW florist has lots and lots of packages. They do not deliver it til after check in though. So if we had gone to our room directly it would not have been there but it was there before we came home from Epcot the first night. Also Perry had to order shoes from Amazon prime and they arrived in a day and a half and were delivered into our room which was awesome. This resort looks awesome! Great idea to have a page per resort! Since there is so much going on at CBR right now I thought I would post a current june 2017 video update of the resort and its construction. Its a real mess but I am looking forward to what's next. and even more information with photos taken last week. oh this is just not a good article!!! I hope its not true... at least I hope its not true soon. ok so this is just my opinion and I have a friend who just got back so I will have her come over here and give her opinion if she has time because she is a new member here. Anyway, I went when it was November last time and before that I went the first week of June and even though it was filled to 100% the entire stay both times, it never felt crowded. However the first stay we were in the building right next to the big pool which was a preferred room and that put us going to the bus stop by Centertown and sometimes we had to wait for a bus and sometimes the busses were very full and we had to stand. Now this last time we stayed in a regular room in Jamaica and the bus stop over there is the first one picking you up and first to drop off at night so it was freaking awesome! Now that being said they have changed how the busses run in there because there are 2 entrances. We prefer Jamaica because its a quick beautiful walk across the island to centertown. That could just be us, but we loved it. Because the resort was full there were tons of busses all the time and even like after Illuminations when our bus spot at EP was rows and rows of people, they had one bus after another picking up and we didn't wait more than like 10 min if that. I can not complain at all about anything. 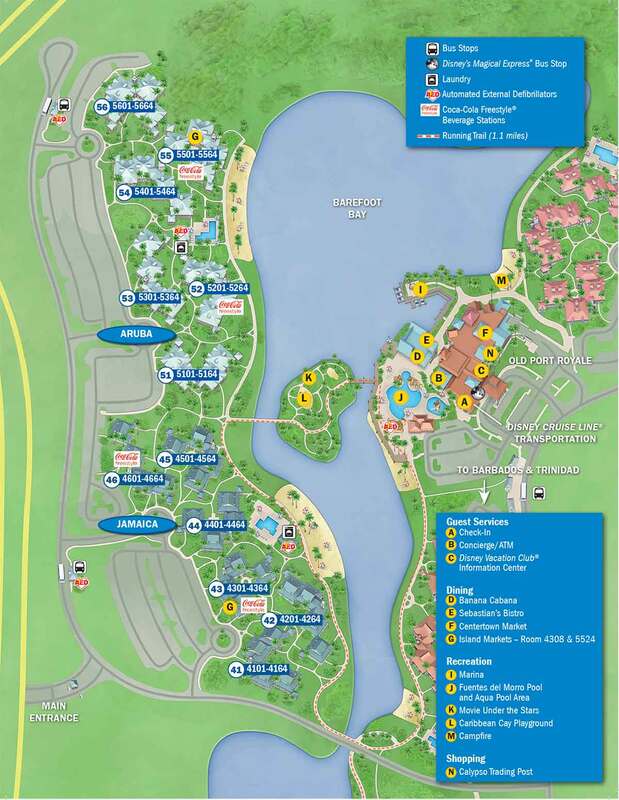 I would pull up a current map and look at the layout of the resort and see what you think, but you need to search for a map that will tell you which rooms are preferred. I think it has the coolest pool except Beach Club. My friend Tammy went on the slide the other day and said it was awesome. One thing though. This past week was spring break and she did mention that they had to close the main pool for a bit on 2 occasions because of an "accident" in the pool - GROSS! and also lightening hit the transformer or generator and they lost power to half the resort and they were relocated to Aof A for one night... but I will have her tell you guys about that. Oh I loved the Caribbean resort! I suppose I could say that we home base at Port Orleans more often than not, not sure why because it looks like home but it is where we end up staying the most. I have tons of photos from there. We love it there because you can take the boat over to shop at Disney Springs throughout the day when we are tired or want a different food location. We have stayed at all the mid-level hotels and at the Grand Floridian as well as some of the All-Star resorts. But, we seem to gravitate towards Port Orleans.